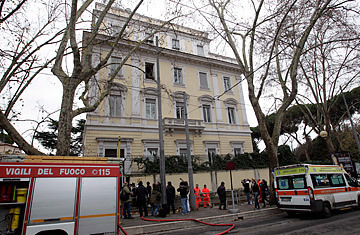 Firefighters stand outside the Greek Embassy in Rome, Monday, Dec. 27, 2010. A package bomb was found four days after similar mail bombs exploded at two other embassies injuring two people. The device was defused and no one was injured. A recent spate of letter bombs dispatched to foreign embassies in Rome, as well as the headquarters of a far-right Italian political party, focused attention upon a rogue group of anarchists that claimed responsibility for the attacks. The Informal Federation of Anarchy says it is a cobbled-together coalition of anarchist outfits in Italy, and boasts ties with like-minded groups across the world. Their parcel bombing campaign follows a similar wave of deliveries sent in November by Greek anarchists to embassies in Athens. But security experts aren't wringing their hands over an emerging global threat. One told TIME that the aborted bombings were simply "something [the anarchists] have to do from time to time to show that they exist." Anarchist organizations in Italy and elsewhere today may be as fringe as analysts say they are, but they are the heirs of a political credo that deeply impacted the past two centuries of world history. The term "anarchism" stems from the ancient Greek anarchos, or "without rulers," and historians see anarchist strains in everything from the writings of certain Daoist scholars in pre-modern China to the emancipatory zeal of early Christianity. But anarchism, as we know it, is a distinctly modern phenomenon, crystallizing in the wake of the French Revolution, as more and more people in the industrializing world chafed both under the yoke of despotic monarchs and the growing power of capitalist elites. The man credited as being the first self-proclaimed anarchist and one of anarchism's most influential ideologues, Frenchman Pierre-Joseph Proudhon, famously said in 1849: "Whoever lays his hand on me to govern me is a usurper and tyrant, and I declare him my enemy." Contrary to contemporary notions of anarchists as trouble-making, chaotic nihilists, Proudhon championed anarchism as the most rational and just means of creating order in society. Among other things, he advocated what he called "mutualism," an economic practice that disincentivized profit  which, according to him, was a destabilizing force  and argued far ahead of his time for banks with free credit and unions to protect labor. What cemented Proudhon's anarchism was his vehement distrust of the state and even electoral politics. Anarchism's 19th century standard bearers were a beguiling, motley troop of globe-trotting intellectuals. Mikhail Bakunin, a larger-than-life Russian known for his great love of cigars, escaped Siberian exile in 1861 and embarked on a whirlwind odyssey that took him first east to Japan and then San Francisco and eventually saw him land in the newly united state of Italy in 1864. There, he developed his anarchist views, building from Proudhon's earlier work his own idea of "collectivist anarchism," where, workers banded together as equals in private associations and wholly controlled the fruits of their labor. Bakunin's writings underpinned "anarcho-syndicalism," a creed that saw anarchist-led labor unions form and fight for greater freedoms across the western world, from the Ruhr Valley to the Rocky Mountains. Yet he also presciently warned against Karl Marx's aspiration for a "dictatorship of the proletariat," writing in 1868 that "socialism without liberty is slavery and brutality." Anarchism's European heyday was in the late 19th and early 20th century. The events of the short-lived Paris Commune in 1871  when France's capital fell briefly under anarchist-communist rule  fired the anarchist imagination. A vibrant print culture emerged of pamphlets and newspapers, distributed widely to a growing working class readership. Labor strikes in remote dusty valleys rapidly became the talk of capitals worldwide. At the turn of the century, anarchist European emigres in New York's Greenwich Village comprised a significant bloc among the restless American city's literary world. The ideology had profound mainstream cachet. Perhaps the most luminous anarchist of the time was Peter Kropotkin, a Russian prince who renounced his hereditary titles and advanced the notion of "mutual aid," pointing to evidence in the natural world of species cooperating together without competition or coercion. Oscar Wilde likened Kropotkin to "Christ... coming out of Russia." Yet, anarchism also had a strong violent streak, with many radicals arguing for direct confrontation with the oppressive state  what could incite revolution better than the "propaganda of the deed" itself? An anarchist assassinated Russia's Czar Alexander II in 1881; in 1901, a Polish-American anarchist shot U.S. President William McKinley. Not surprisingly, governments spied and loudly denounced lurking anarchist threats in all sorts of cases, from the controversial Sacco and Vanzetti trials in 1920s Massachusetts to unrest in colonial India. Anarchism's last great, albeit fleeting, moment under the sun came at the time of the Spanish Civil War. For a few years in the 1930s, anarchist collectives thrived in Catalonia. George Orwell, who threw in his lot with an anarchist faction, wrote admiringly of his Spanish comrades: the fiercely egalitarian anarchist militias, said Orwell, "were a sort of microcosm of a classless society... where hope was more normal than apathy and cynicism." Of course, as Orwell charts in Homage to Catalonia, the anarchists' downfall comes not at the hands of Gen. Franco's fascists, but during an internal putsch among Spain's Republicans, led by U.S.S.R-backed Communists. An ideology that loathed hierarchy could never be tolerated by Stalin. In the decades since, the allure of anarchism as a viable political system has faded. Its adherents and symbols  the black flag of anarcho-syndicalists and the "A" enclosed by a circle  remain. The tradition of "antifa," or anti-fascist mobilization and activism popular throughout Europe, particularly in politically polarized societies like Greece and Italy, draws on the support of self-proclaimed anarchist groups. Anarchists have also fueled the "anti-globalization" movement, a legacy that has twinned the ideology with images of crunchy protestors hurling stones through Starbucks windows or chaining themselves to trees. It's unlikely the 21st century's anarchists, raging against the collusion of multinationals and the state, will ever have the same appeal as their predecessors more than a century before. The U.S. itself had a rich tradition of anarchism, whose guardian angel was the famed New York writer and activist Emma Goldman. It can be argued be that the logical heirs to Goldman and her anti-government fellow travelers are, in some form, today's Tea Party  only in the past half century has a distinction been made between the term "libertarian" and "anarchist." But Sarah Palin probably hasn't read Proudhon or Bakunin; nor did they likely have someone like her in mind.